This is a guest post from Harry Knibb, Principal Consultant for Sustainable Places, WSP, as part of Future of London’s Workspace for All event. Our climate is changing, resources are finite, society is becoming older, lonelier and facing new health challenges, and technology is evolving at a faster rate than ever before. As these trends converge, the type of jobs we do, and how we do them, is altering rapidly. This is problematic for the built environment for two reasons; first, our existing stock can quickly become unfit for purpose, and second, given that it can take years to design and build new workplaces, there is a danger they miss the mark, delivering outdated solutions into a dynamic and evolving market. In a world where only five skyscrapers have ever purposefully been deconstructed, getting it wrong could mean locking-in unproductivity now and for years to come. However, awareness is growing – nobody wants to work in an unhealthy space and no one wants their business and employees’ productivity to be hindered by their working environment. It appears we’re reaching a significant turning point in human-centric design. At WSP we’ve set a clear path to overcome these issues, with a twin focus on wellbeing and productivity that when combined can create thriving workplaces and communities. But how does this work in practice? Location: for instance, an urban location can provide a health dividend over countryside living due to more active travel. 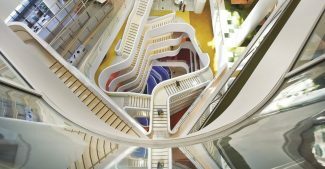 While a shift in our planning for wellbeing can bring about a concerted change in the design of our future workplaces, our increasingly fragmented, multi-location approach to working means that the office is only one piece of the future workspace puzzle. To maximise productivity gains from new development, we must consider the productivity of the place as a whole. The SHARE approach below can be used as a tool to understand how to apply a productivity ‘lens’ throughout the planning and design process. Spaces – comfortable, high-quality outdoor spaces can boost dwell time, attract investment and encourage ‘knowledge spillovers’. Empty space can be used for collaboration, or by start-ups or community projects. Health – people-centric designs for buildings and streets positively influence mental and physical health. This helps companies to retain talent, makes people more productive and reduces absenteeism. Accessibility – enabling mass movement through cycling and walking increasing social integration and reduces congestion, saving unproductive travel time and commuter stress. Inclusive developments enable more people to work and remain independent for longer. Resilience – future-proofing city systems prepares the local economy and people for changes in climate, technology and demographics, helping to maintain productivity and operations during disruption and reduce future costs. Engagement – communities that can engage meaningfully in decision-making can create a sense of ownership and navigate potential resistance. City leaders need to put communities at the heart of regeneration so that they can be part of a more productive future where they live and work. Both operators and landlords are well placed to meet these evolving demands. It’s important that we thoroughly engage cross-sections of industry in the benefits, using different metrics to motivate people across specialisms. Whilst wellbeing and productivity can often seem intangible and distinct from the hard-wired process of designing a new or retrofitting an old workplace, these concepts have the potential to be lifechanging for occupants, and provide economic benefits to business for years to come. By embracing wellbeing and productivity movements in tandem, industry will see that what makes sense for us to be healthy, productive individuals simply makes good business sense too. Find out more about Future of London’s Workspace that Works project.